I did extensive research on what I would use for transportation for my trip. My original plan was to use my Tacoma pickup truck and purchase a light weight truck cap with pop up top. There were a number of problems with this the major one was cost. The need for a light weight camper is because of the Tacoma's payload of about 1100 lbs. The camper weighed in at at least 800 lbs. and this was dry & no personal items. Many people do this putting on rear airbags but ultimately exceeding the GVW. The other problem is that these units are not sold further east than Wisconsin. This would leave me to a trip to get it or hall everything it need and buy it on the way. Oh the cost of $16K was not not what I wanted to spend considering that I don't know if I would enjoy doing this. This idea of the truck camper did not prove to be a great option. My next idea was to get an oversized truck cap and build the inside to my liking. I went so far to create a very elaborate design around a truck cap that again only available in California. I would again have to get to CA with all my belongings somehow secured and the. Spend about 2 weeks at my son's house in La Jolla building the inside. It would have been logistically challenging but for a past project manager something that would be fun and frustrating at the same time. Since this was the plan of choice for some time it did purchase a number of things to make this work before finding the Camper Van. I did purchase a very high end cooler that runs on a true compressor and is super efficient. At a $800 price it is expensive, but can be used for years on day trips. That is excellent about it is that it runs on 12volts so efficient it uses less than 2 amps. So, this is a great choice to use on this trip as I plan to be off grid a lot of the time running off batteries as it is more efficient than the 3-way fridge in the camper van. One other thing I bought was airbags for the rear go the Tacoma. I installed them and after one bag problem that was addressed up under warrantee by Firestone they work great and will be useful for a lot of heavy hauling for future projects at home and camp. There were other issues for using the Tacoma bed the biggest one was that although I have a 6 ft. bed length I am 5'11" and that meant sleeping straight would require sleeping on an angle to the bed. The camper van idea came from me looking at campers on how they are laid out for my truck bed design and then looking at prices. A visit to Craig's List brought me to the one I'm the picture above in Greenville, NH. Although 20 years old by model year I decided to take a look. I have developed a good ability to look at used vehicles having done much of my own vehicle work over the years. What I don't have knowledge about are camper specific items. When I arrived looked in good shape. I proceeded to climb under and look for body rust and there was none. I listened and checked out the engine. There was only a squeak in the engine that I know to be an idler pulley sound. I learned that the husband and wife that were selling it only owned it for this past summer having bought it from the original owner who is now in his 90's and still works in his garage business. breaks were new, exhaust new, and new Michelin XLT tires. I know them well as tat is what I have on our Highlander. All in all in good shape. I got a w quick overview of the camper items and the inside looked good but in need of some updates. I was told the radio didn't work, but this wasn't a bother as electronics are no problem to deal with. After a short should I / shouldn't I the decision was made right then and there to purchase it. having done some prior research I knew the pricing of such units and it was a decent deal. 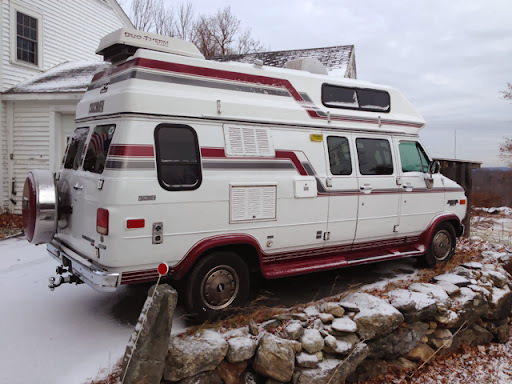 It was delivered for me and I went to register it and the RMV said wait a week as it's a camper with yearly registration and it was still November. I would have had to register it and then pay for a new registration the following week in December. Having secured my wheels & sleeping arrangements it was time to outfit it for the trip.